"Delta" Occasional Arm Chair or Dining Chair. Available in a waterproof fabric! "Delta" Occasional Arm Chair or Dining Chair. Available in a waterproof fabric which makes them perfect for the dining room, waiting room or for nursing homes. This commercial graded waterproof fabric comes in 100s of colours and patterns. Also available in other leg stains. Our solid frames are made from hardwood and Vic Ash. Seat suspension can be either a strong durable webbing or sprung. We also use top quality foams to last. Many of our aged care clients have expressed their disappointment of previously purchasing cheap chairs elsewhere that have only lasted a few weeks and also the lack of variety out there in sizes and colours. When these cheap chairs have fallen apart they have also found that there is no maintenance or repair service. Our clients are now extremely happy with our sturdy well made Delta Chairs that are still in heavy use and handling it extremely well. Many of these clients have now returned to order further chairs for other venues and know that our frames will last and that JARO can reupholster the covers when the time comes for a fresh new look. 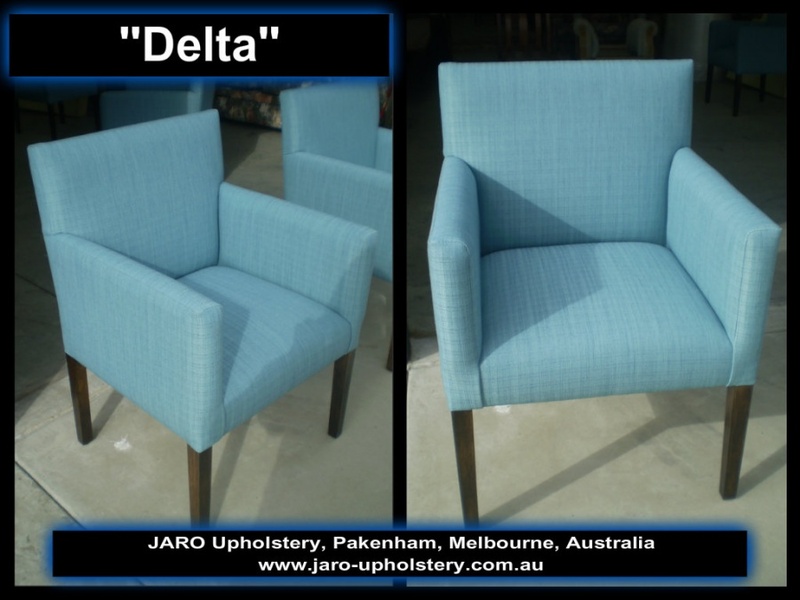 If you would like to view the Delta chair and the many options in sizing and fabric please contact Jason on 0402 188238 or email enquiries@jaro-upholstery.com.au. JARO also has a range of sturdy, supportive and comfortable tub and wing chairs if you wish to see them.